Gorgeous Contemporary home in South Hero! Now’s your chance to own this spacious 3 bedroom, 3.5 bath home on quiet, wooded lot. Immediately fall in love with the open floor plan that boasts bright kitchen with nice center island, stainless steel appliances to include Viking Stove & dual dishwasher, walk-in pantry, custom Hickory Cabinets, and granite counter tops. Open concept living area with lovely cathedral ceilings, hardwood floors, Hearthstone woodstove & slate hearth, and access to wrap around balcony with beautiful views! Enjoy entertaining family and friends in formal dining area off kitchen and living area. Charming master bedroom with walk in closet, private deck, and private bath with soaking tub, dual vanity, and 3/4 shower. Copula sits on upper level with gorgeous lake and mountain views. Family room in finished basement with fireplace, with walk-out to covered patio. Two offices with warm natural light on main level makes for a great work space or playroom area. Other great features include central air, central vac, 2 laundry rooms, cork floors, custom lighting fixtures, plenty of storage and more! Beautiful slate mudroom with attached 1/2 bath and first floor laundry room, along with attached 1 car garage! 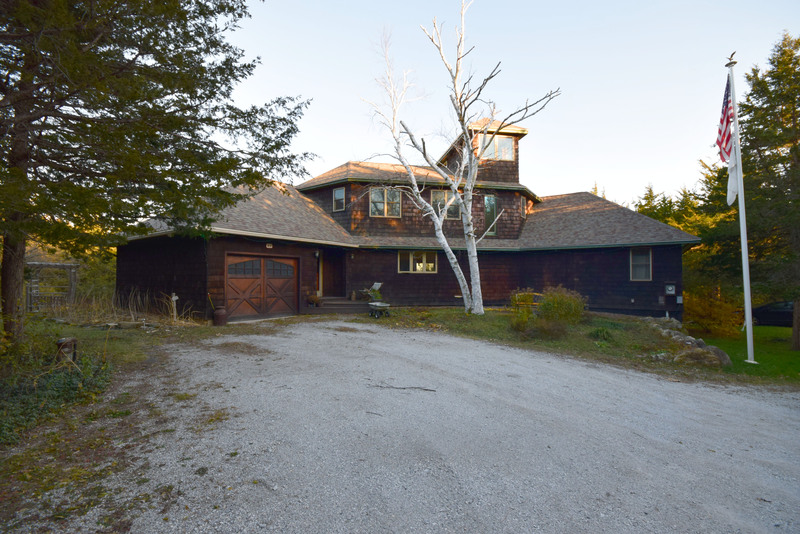 Home sits on 2.0 acres of land with backyard made for entertaining! Don’t forget to check out the built-in fire pit and outdoor hot tub! Why wait- act now on the opportunity of owning this amazing contemporary home! Directions: Take U.S Hwy 2, turn left on to Ferry Road, turn left on to Maple Ridge Lane. Home at end of Lane.